Picture yourself dining in a stunning timber lodge, set in the midst of a garden and water landscape, complete with island gazebo for special outdoor celebrations. Add to that vision a menu offering exotic as well as tried and true culinary delights, served in your choice of a fine dining or casual setting. 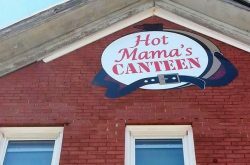 Finally, imagine enhancing your culinary experience with a leisurely drive through some of the most scenic countryside in Western New York. Such is the list of reasons why it’s worth the trek to Varysburg, about 15 miles south of East Aurora, to enjoy The Hidden Valley Lodge and Trailside Grill Restaurants. All that and the 60-acre, 30-species, exotic animal park that complements the Hidden Valley experience. Hidden Valley is the dream-to-reality vision of Wyoming County dairy farmer, Hans Boxler. At 78 years young, Boxler capably oversees his family’s farm operation (the largest dairy farm in the county) while keeping his eye on all aspects of Hidden Valley’s animals and operations. His success with both businesses is a credit to Boxler’s unwavering work ethic as well as his creative foresight. It is also indicative of the dedicated family members and accomplished professionals who work alongside the spry farmer in helping to achieve his vision. One of those supportive professionals is Neil Coogan, Hidden Valley’s Food and Beverage Manager. Chat with Coogan and his Dublin brogue quickly reveals a heritage far from the Buffalo Niagara Region. Query the Irishman about his professional experience and a map of the world unfolds, with true love serving as the enticement that ultimately led him to Western New York and Hidden Valley. Coogan’s executive duties keep him primarily focused on the complete dining experience at both the Lodge and the Trailside Grill. Yet the food executive manages to add an occasional culinary touch to the dinner menus created by Hidden Valley Chef, Paul Szymanski. One of Coogan’s “touches” that has proven highly popular is his grandmother’s own Shepherd’s Pie, featured on the Hidden Valley winter menu. 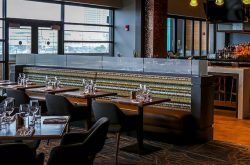 Additionally, in the nature of any true Irishman, Coogan has been become popular for his special-occasion, tableside service where he dramatically prepares flamed versions of his homeland’s whiskeyed coffee for Lodge diners. 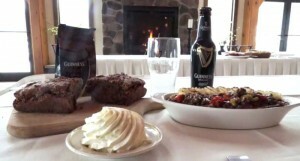 It is Hidden Valley’s unique combination of dining excellence and authentic Irish cuisine that made it the perfect choice for this, our Step Out Buffalo St. Patrick’s video. To all who are Irish and those who wish they were, we hope you enjoy. Slainte! More information about Hidden Valley Animal Adventure and Restaurants can be found on their website. >>The music featured in this video is called Pleasures of Home by husband and wife duo Kindred. Read more about them, here! 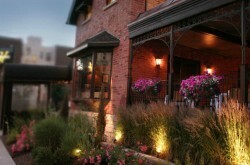 >>This video is presented by StepOutBuffalo.com in association with BuffaloStyle & produced by WNYMedia.net.